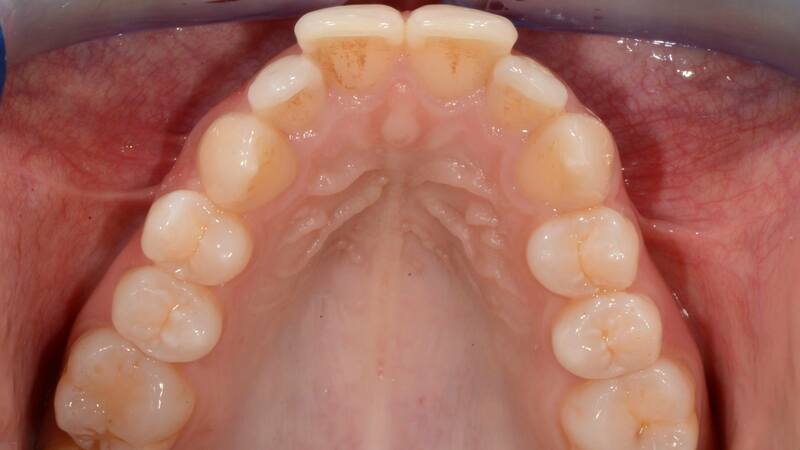 A 26-year-old female patient presented because she wanted to have her teeth straightened. 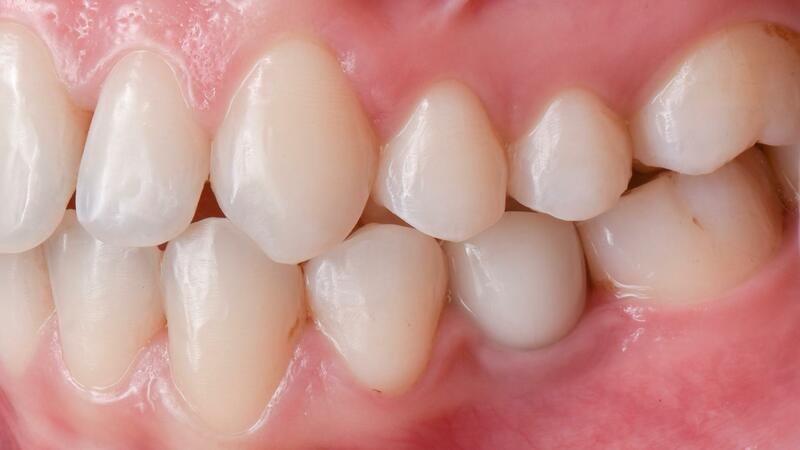 Due to an aplasia of the two lower second premolars the deciduous second molars were still in place. 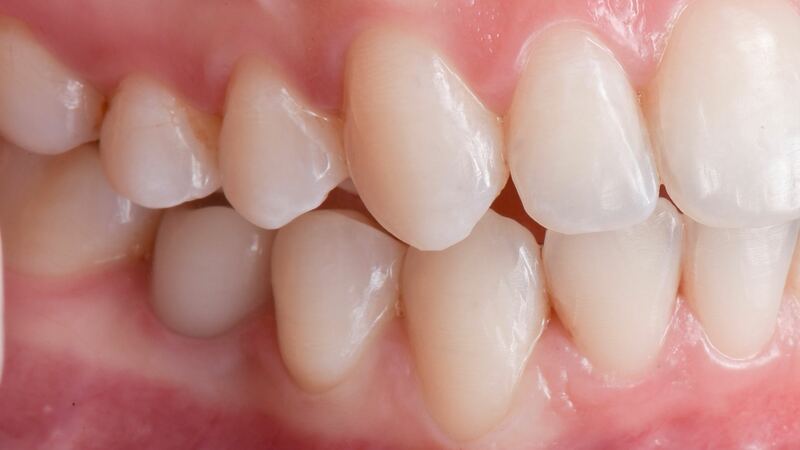 A treatment option could have been to preserve the deciduous teeth, but in this case the decision was made to replace the baby teeth with implant restorations. 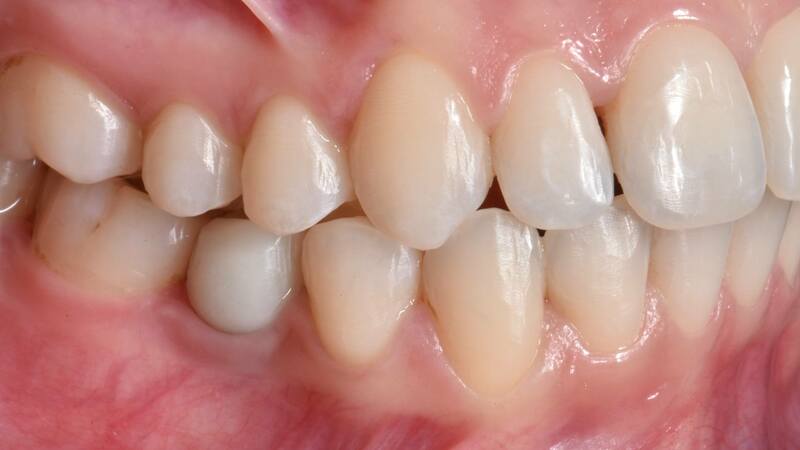 The space difference between the deciduous teeth and the permanent teeth was to be used to solve the crowding of the anterior teeth. 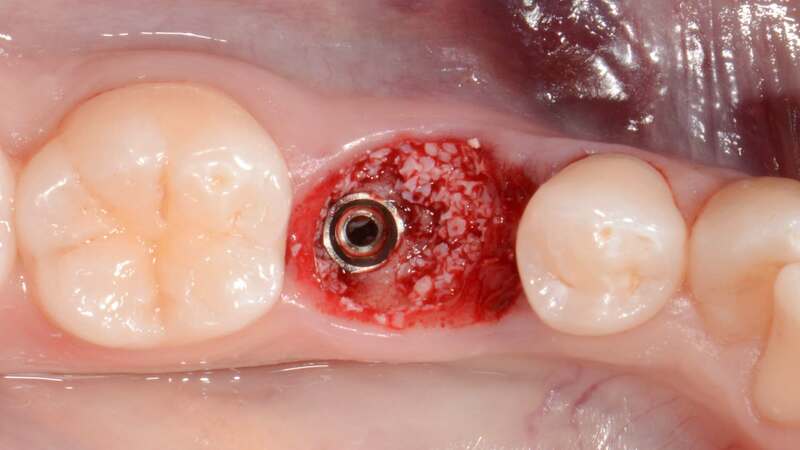 This clinical case describes the extractions of the lower deciduous second molars, followed by immediate placement of a dental implant in each socket, which resulted in the preservation of the hard and soft tissues at the extraction site. 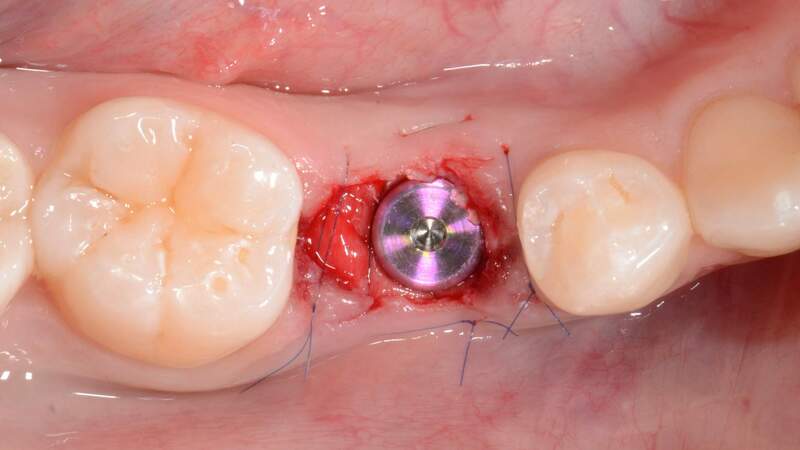 One implant was placed distally and the other one more mesially in the gap, as on one side the gap was to be closed from the distal and on the other side from mesial. 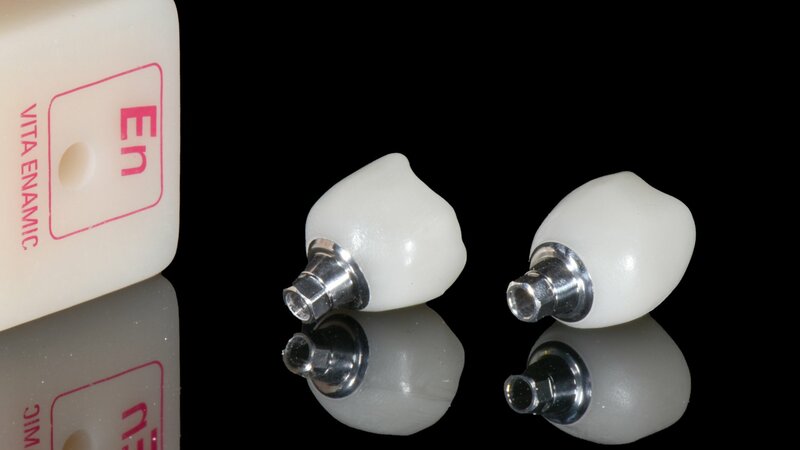 Three months later the implants were provisionally restored and were used as anchorage for the orthodontic appliance. 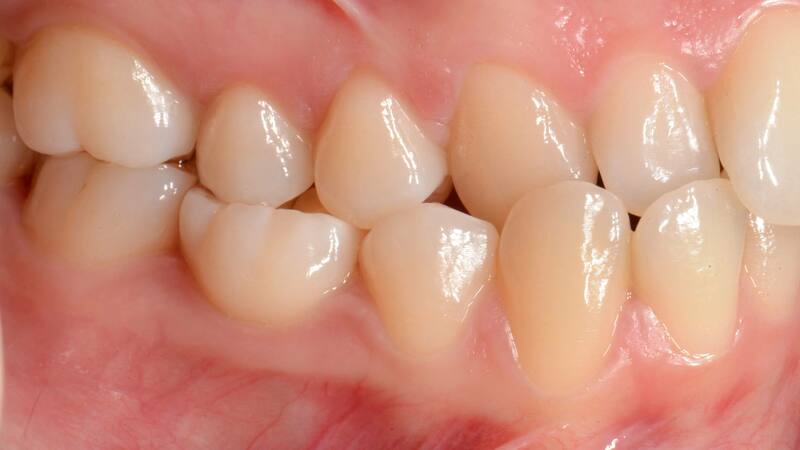 After the completion of the orthodontic treatment the final restorations on the implants were placed. 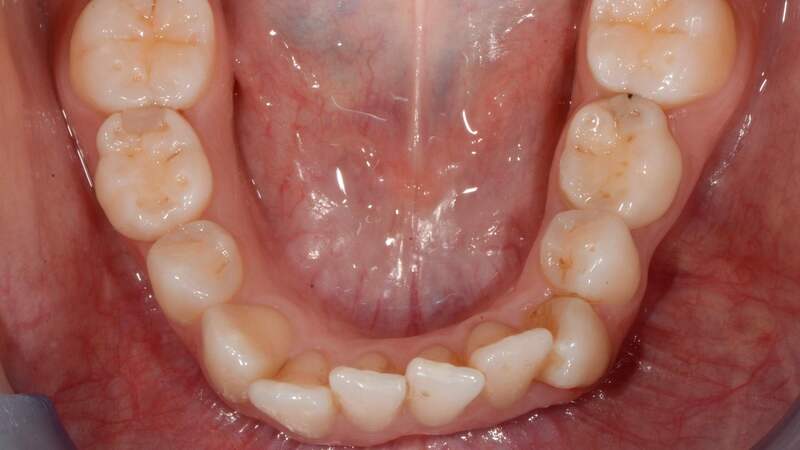 Frontal intra-oral view. Note the right lateral crossbite and the moderate crowding. Also, the midline is shifted to the right. 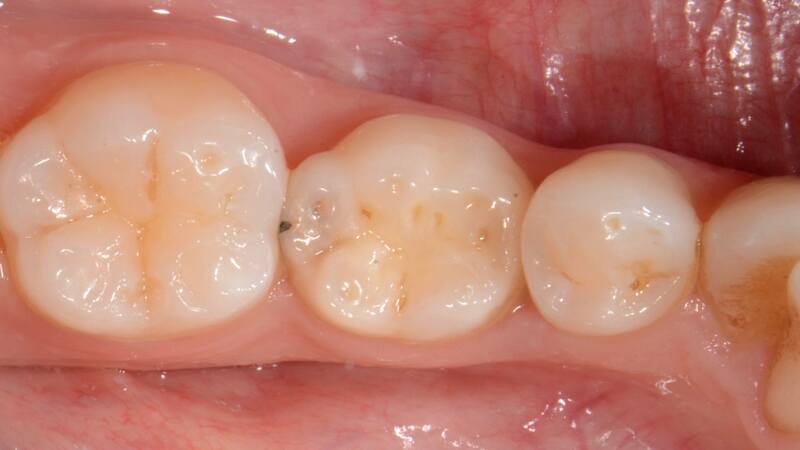 Deciduous right second molar is still present due to the aplasia of the right second premolar. 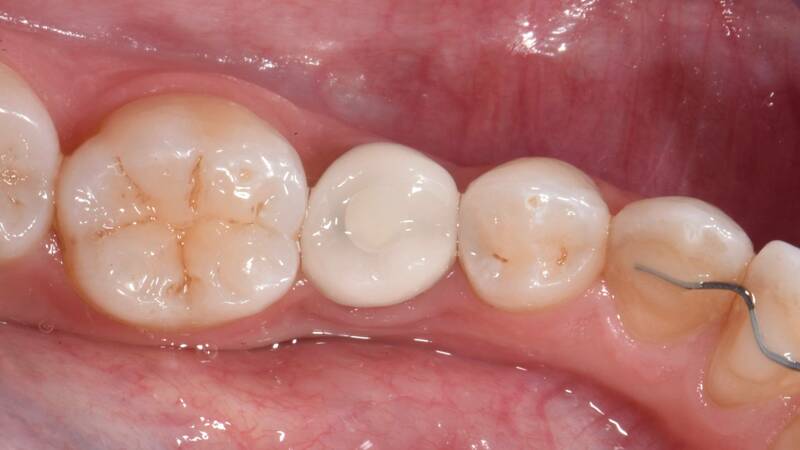 Deciduous left second molar is still present due to the aplasia of the left second premolar. Occlusal view #75 (FDI) / #K (US). Initial panoramic x-ray. 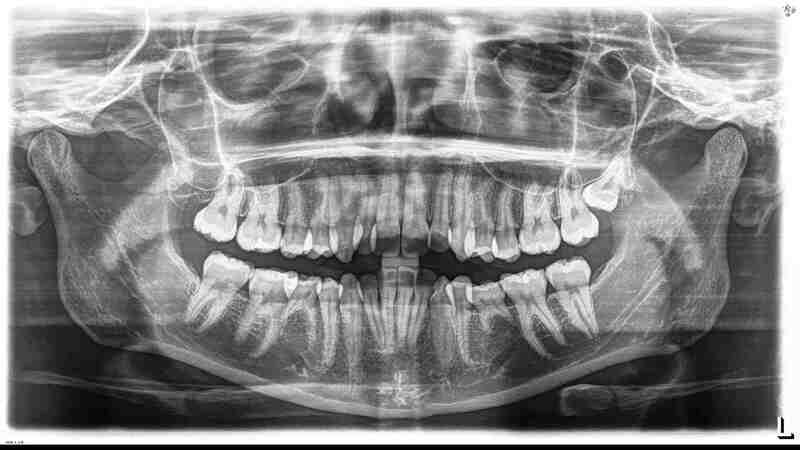 Note that all wisdom teeth are missing except the upper left one (unerupted). 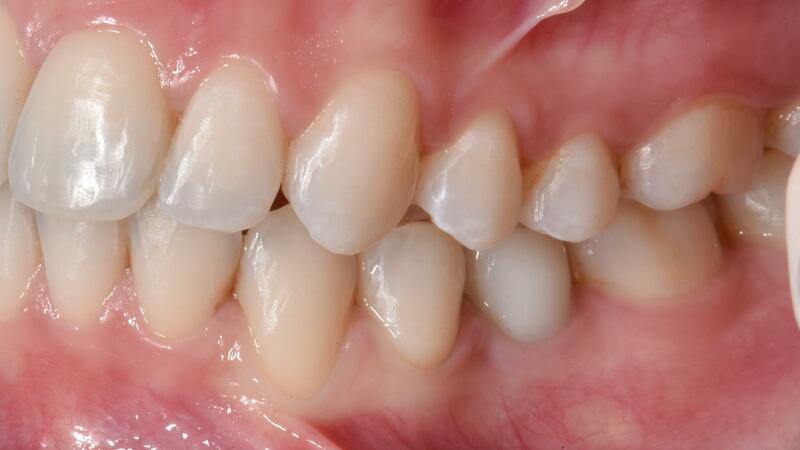 Aplasia of the lower second premolars. 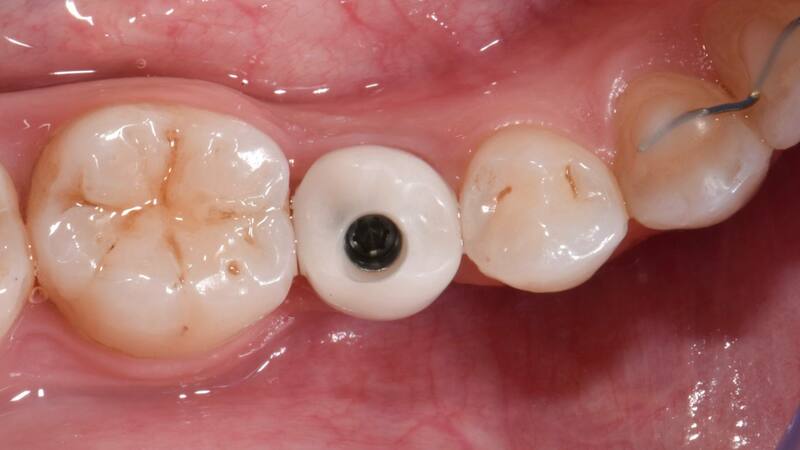 Intra-oral occlusal view after extraction of #75 (FDI) / #K (US). 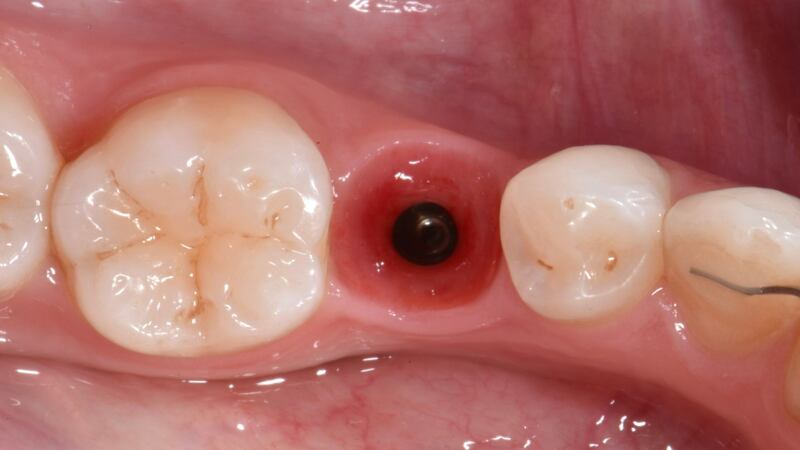 Intra-oral occlusal view of immediate implant placement post-extraction #75 (FDI) / #K (US). It was placed mesially in the gap because the space was to be closed from the distal. 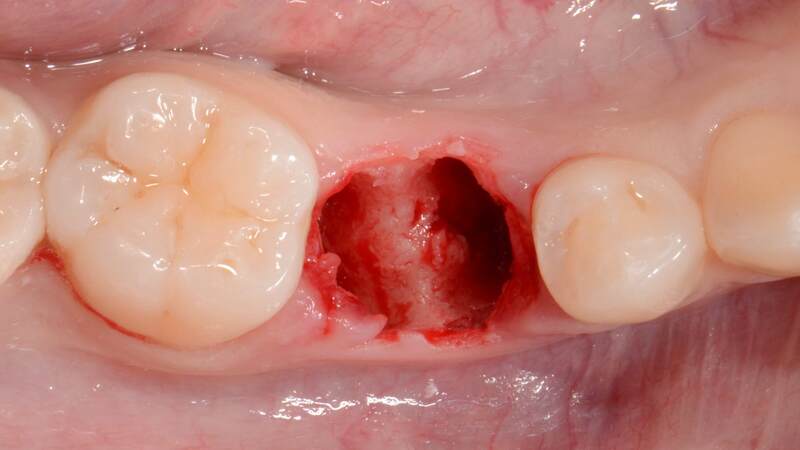 Intra-oral occlusal view. The grafting material used was BioOss, which is physically and chemically comparable to the mineralized matrix of human bone. 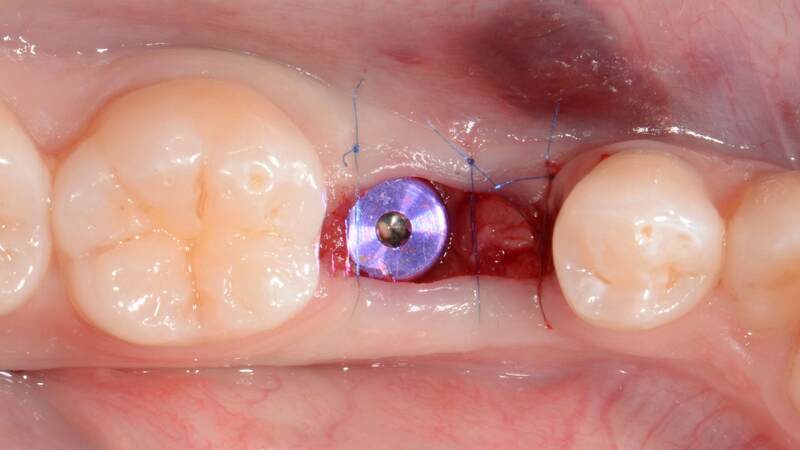 Intra-oral occlusal view of healing cap and stitches. 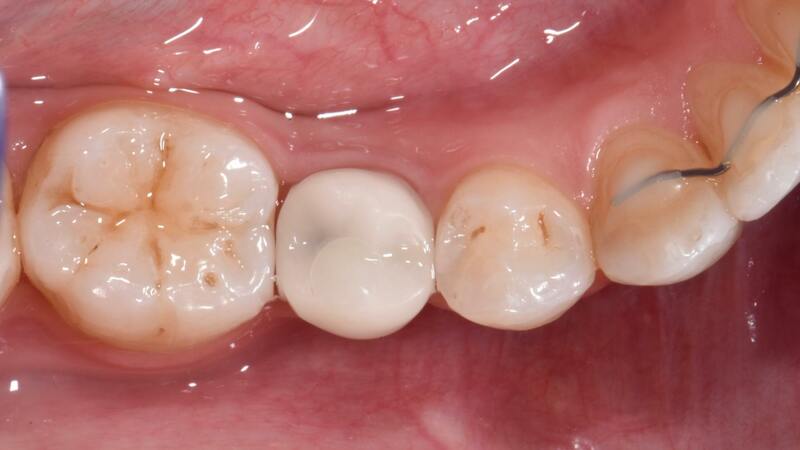 A resorbable collagen membrane (Creos Xenoprotect) was used to stabilize the BioOss. 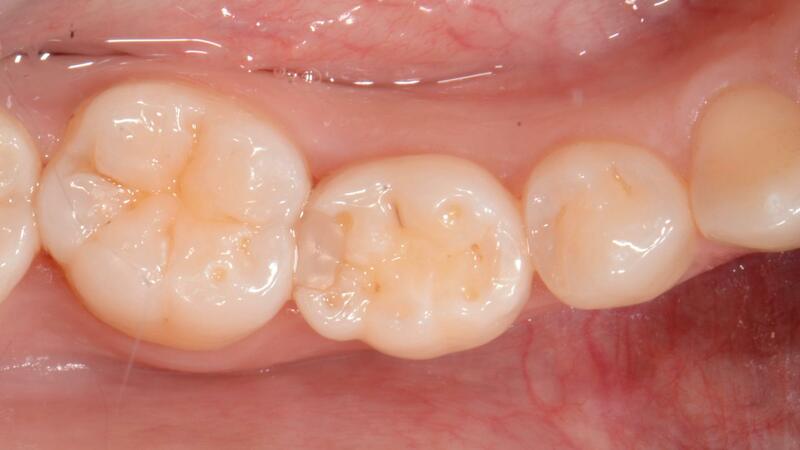 Intra-oral occlusal view after extraction of #85 (FDI) / #T (US). 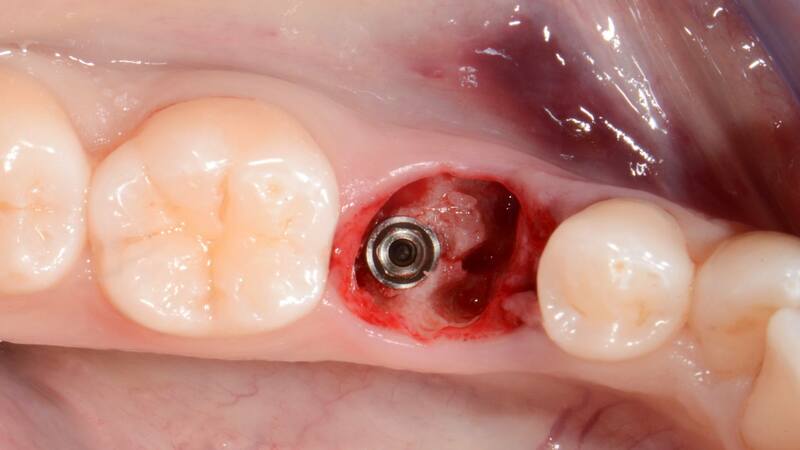 Intra-oral occlusal view of immediate implant placement post-extraction #85 (FDI) / #T (US). 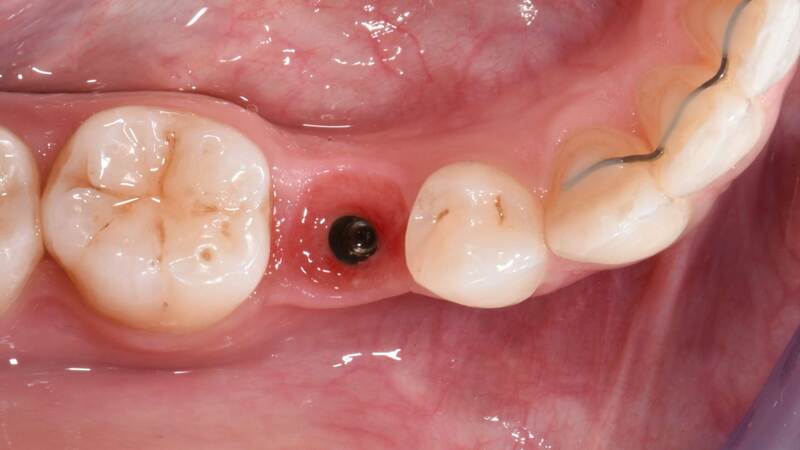 The grafting material used was BioOss which is highly successful in helping new bone to form. 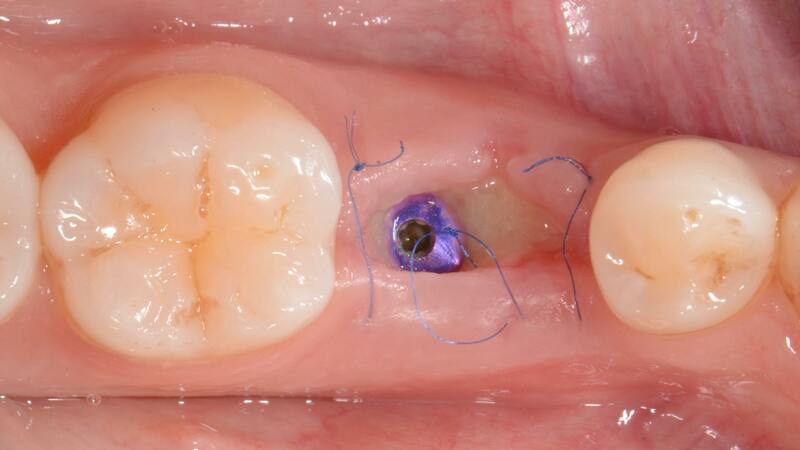 Intra-oral occlusal view of healing cap and stitches. 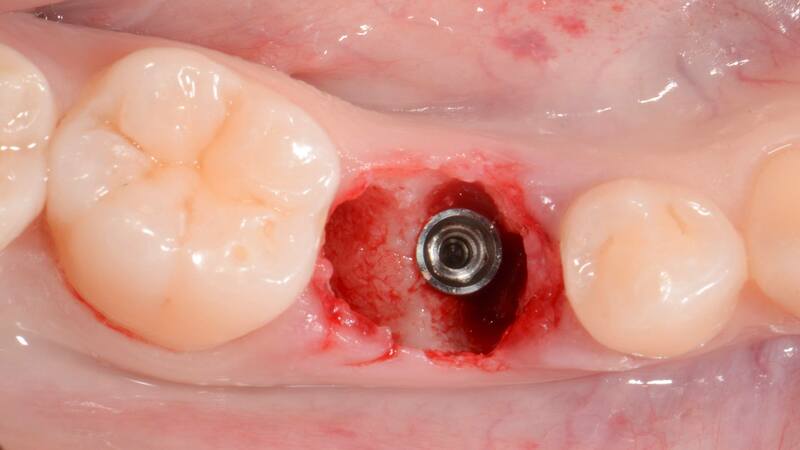 The Creos Xenoprotect holds the bone graft material (BioOss)securely in place. 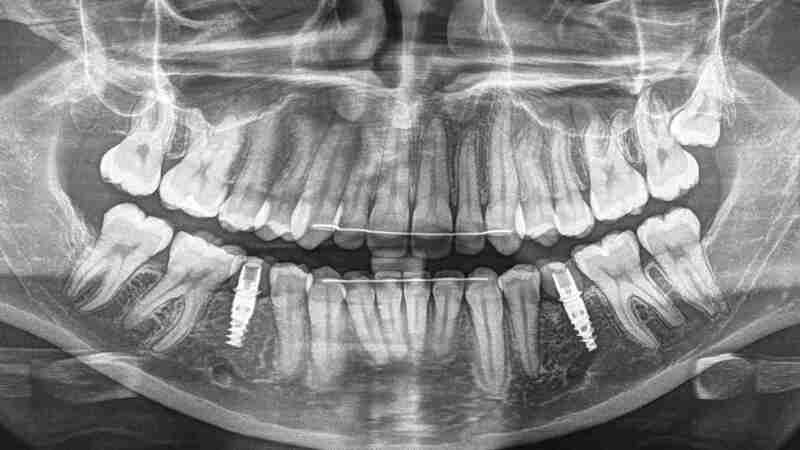 Panoramic x-ray after implant placements. 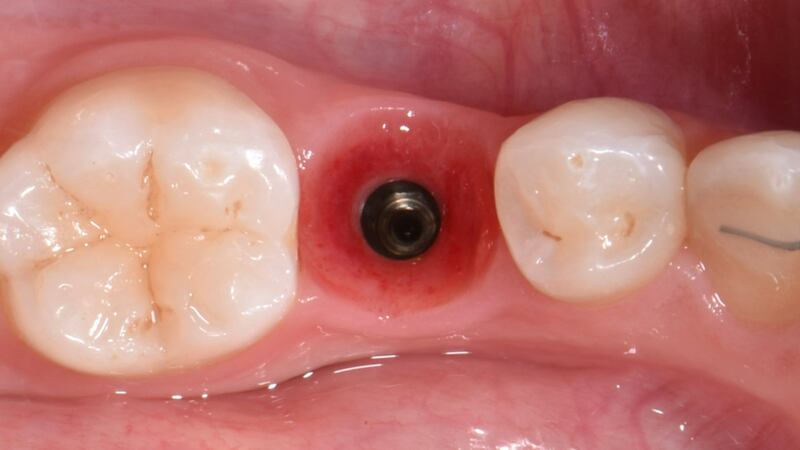 Intra-oral occlusal view of the lower right implant 1 week after the surgery. 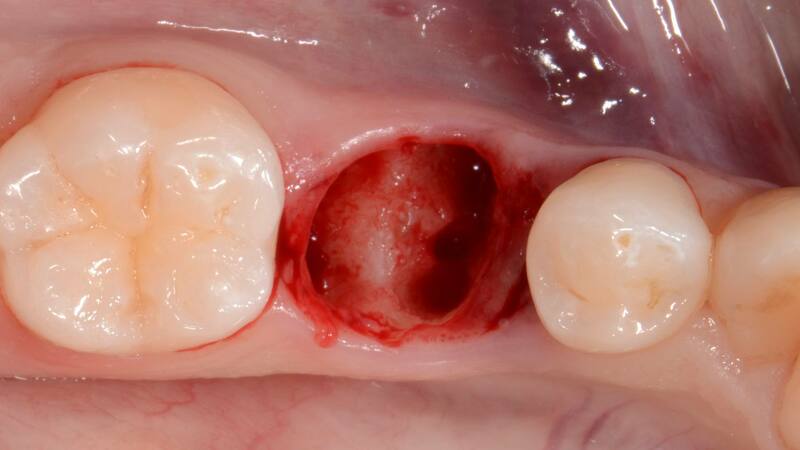 Intra-oral occlusal view of the lower left implant 1 week after the surgery. 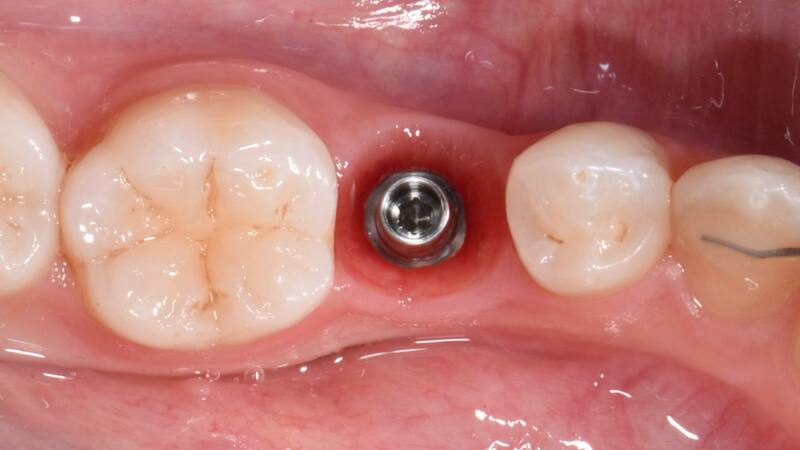 Intra-oral view of lower right healing cap 3 months after the implant placement. 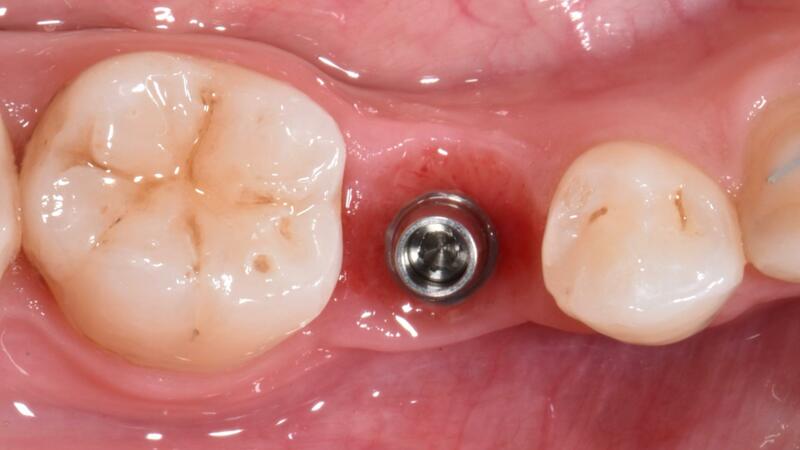 Intra-oral view of lower left healing cap 3 months after the implant placement. 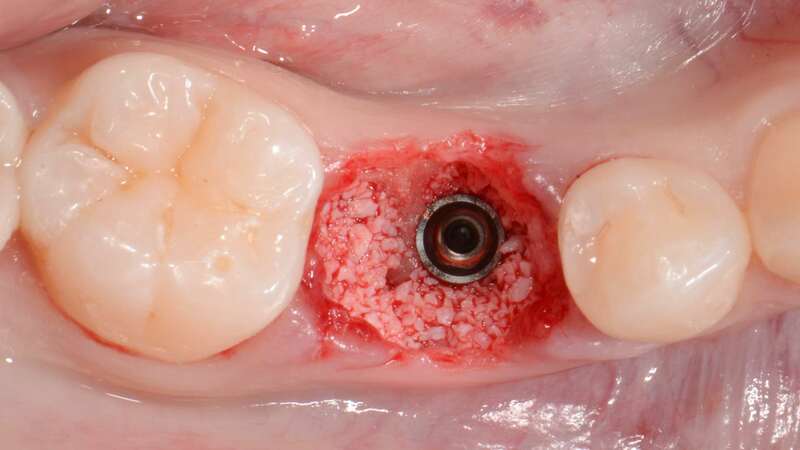 Healing cap was removed as the healing and osseointegration were satisfactory. 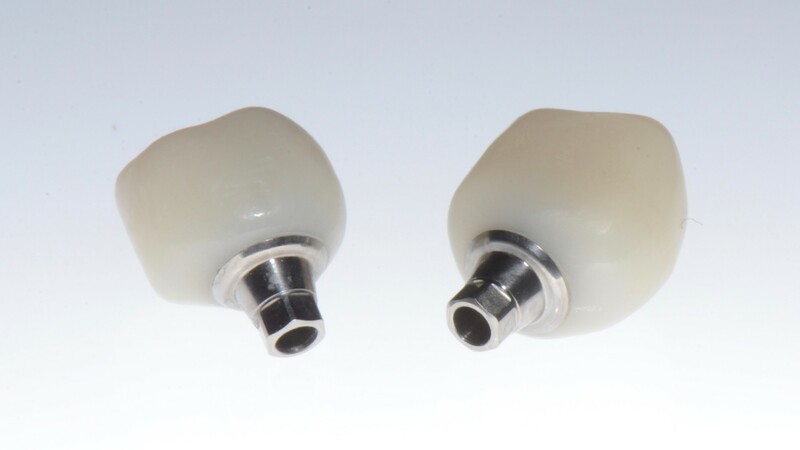 Healing cap was removed as the healing and osseointegration was satisfactory. Lower right scanPost was placed which has the male orientation notch to correspond to the female notch on the scanBody. Lower left scanPost was placed which has the male orientation notch to correspond to the female notch on the scanBody. 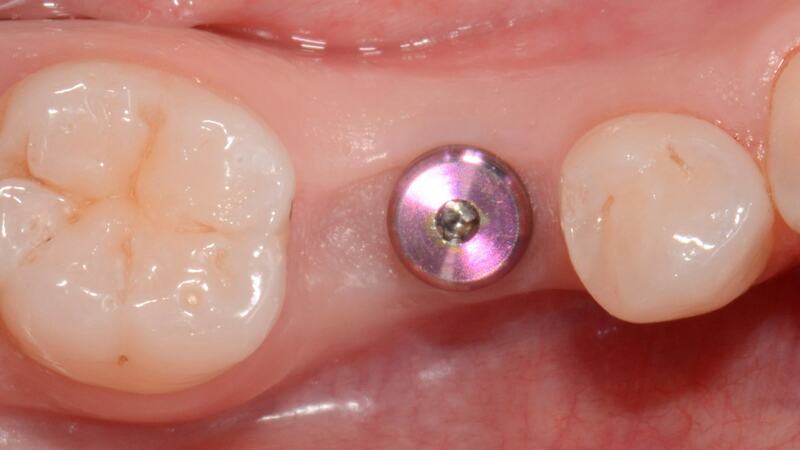 The lower right scanBody was placed in order to scan intraorally with the Cerec camera. 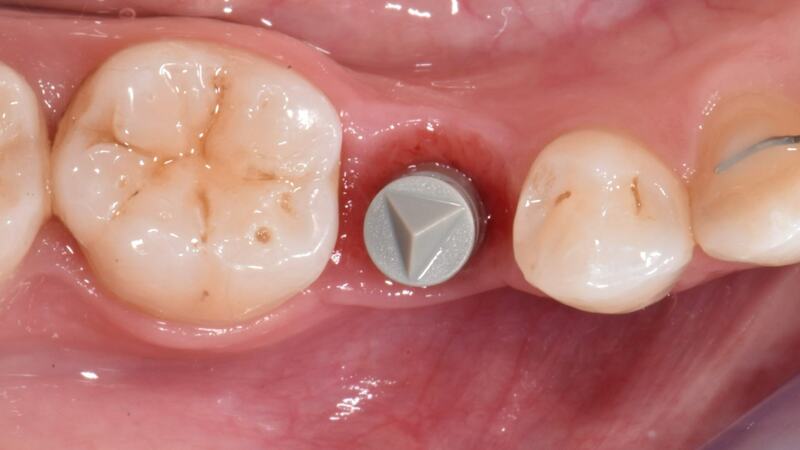 The lower left scanBody was placed in order to scan intraorally with the Cerec camera. 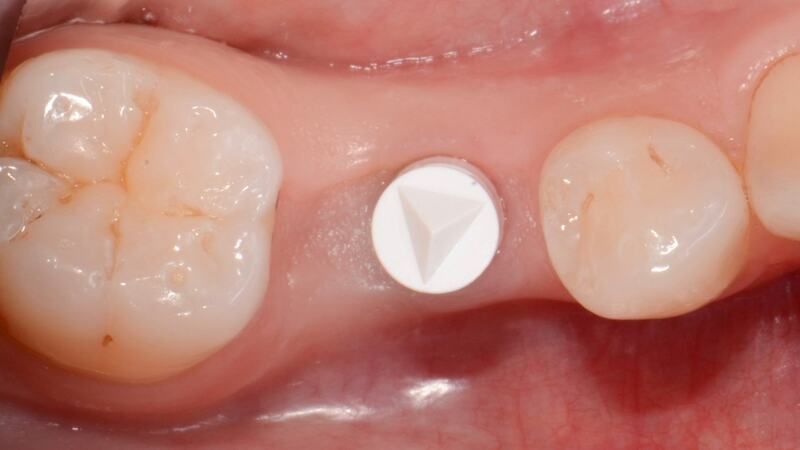 The provisional crown restorations were milled. 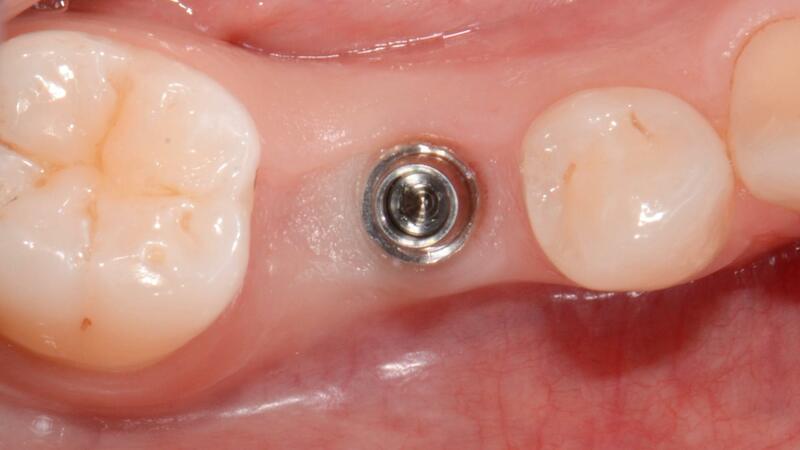 #85 (FDI) / #T (US) provisional crown was fitted. #75 (FDI) / #K (US) provisional crown was fitted. 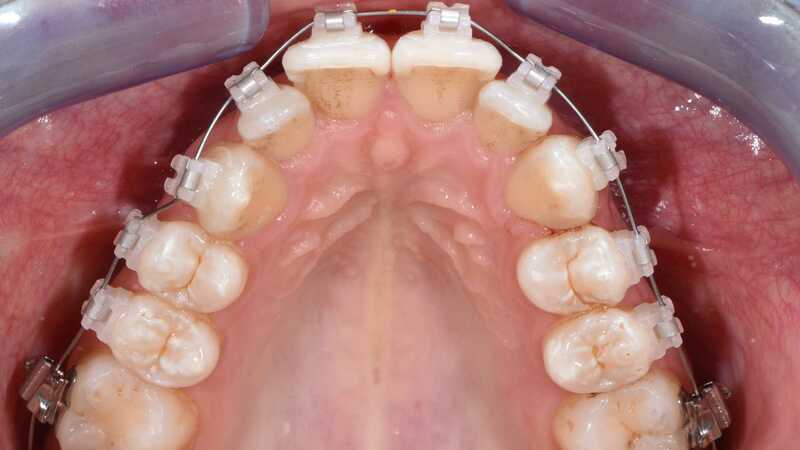 Frontal intra-oral view of fixed orthodontic buccal braces. 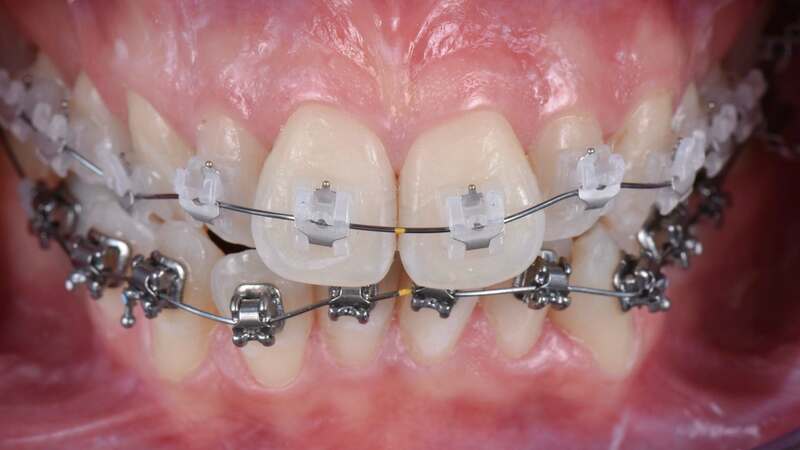 Intra-oral right lateral view with orthodontic braces. 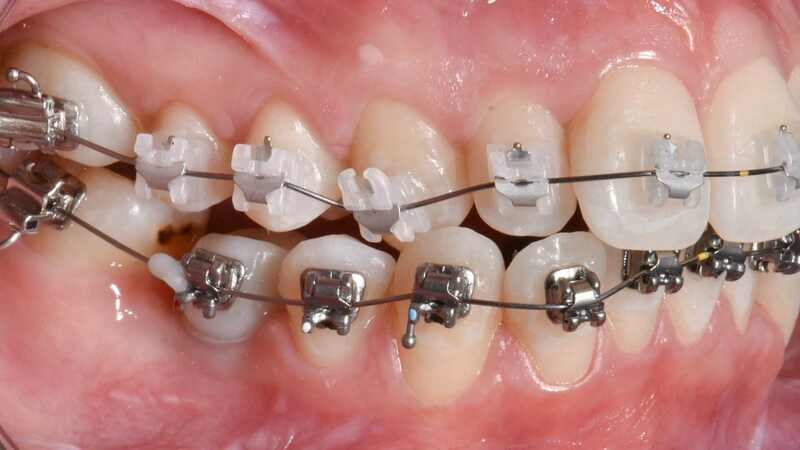 Intra-oral left lateral view with orthodontic braces. 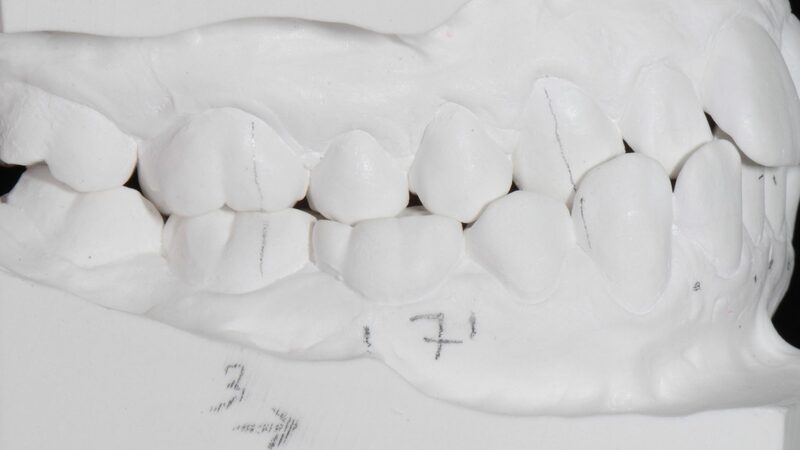 Maxillary occlusal view with orthodontic braces. Note that tooth colored brackets were used on the upper teeth. Mandibular occlusal view with metal brackets. 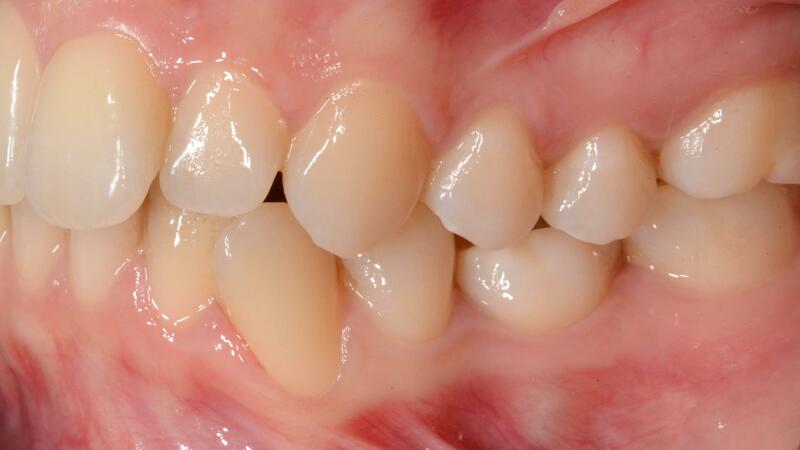 Frontal intra-oral view after the orthodontic treatment was completed. Note that the midline deviation has been corrected. 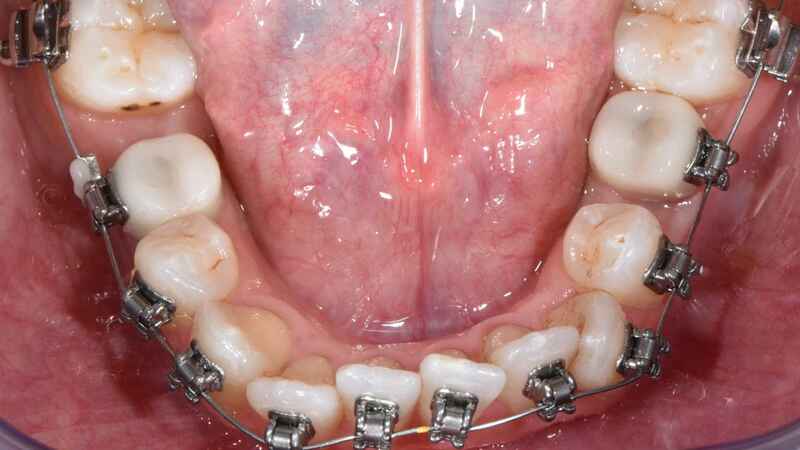 Right lateral intra-oral view after orthodontic treatment. 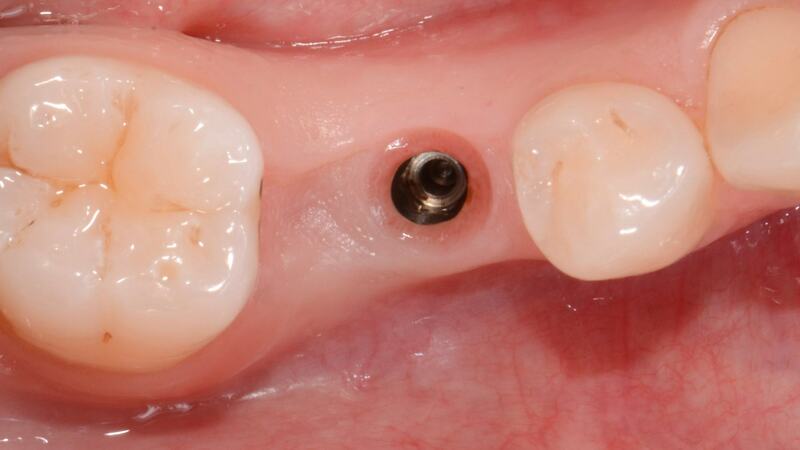 Note that the gap between implant restoration and adjacent teeth is closed. 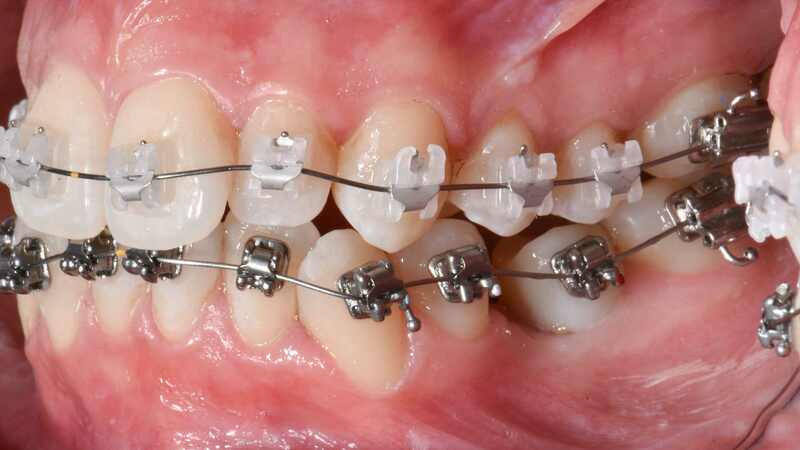 Left lateral intra-oral view after orthodontic treatment. 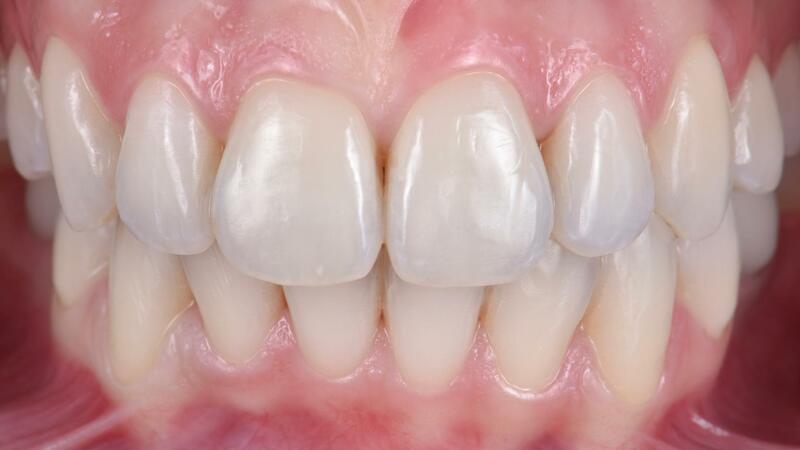 Note the gap between implant restoration and adjacent teeth is closed. 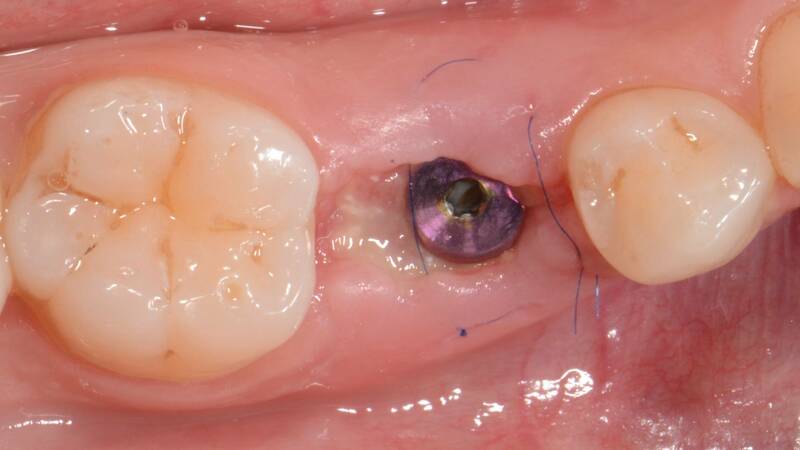 Occlusal intra-oral view of provisional left implant restoration. 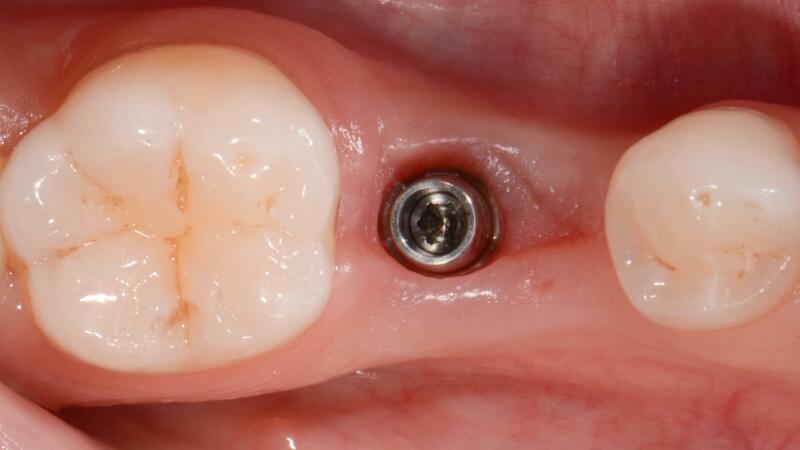 Occlusal intra-oral view of provisonal left implant crown removed. Occlusal intra-oral view of lower left scanPost placed. 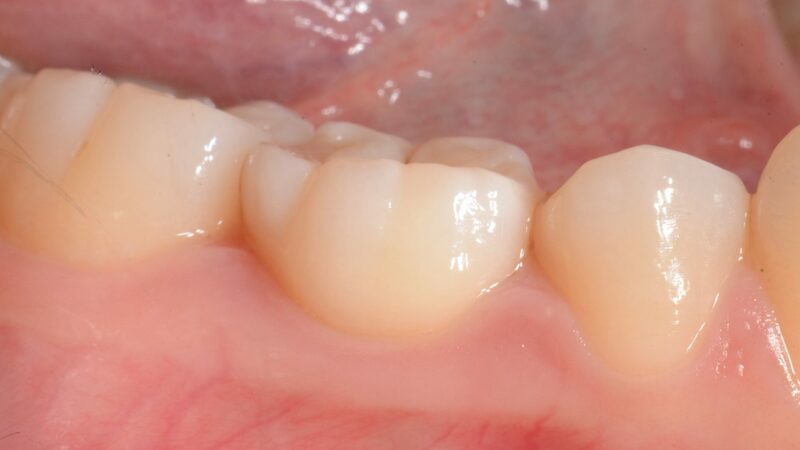 Occlusal intra-oral view of the lower right provisional crown. 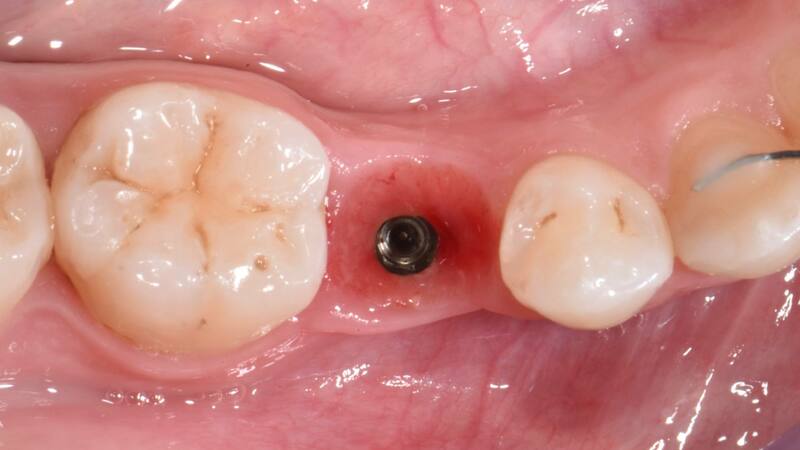 Occlusal intra-oral view of provisional right implant crown removed. 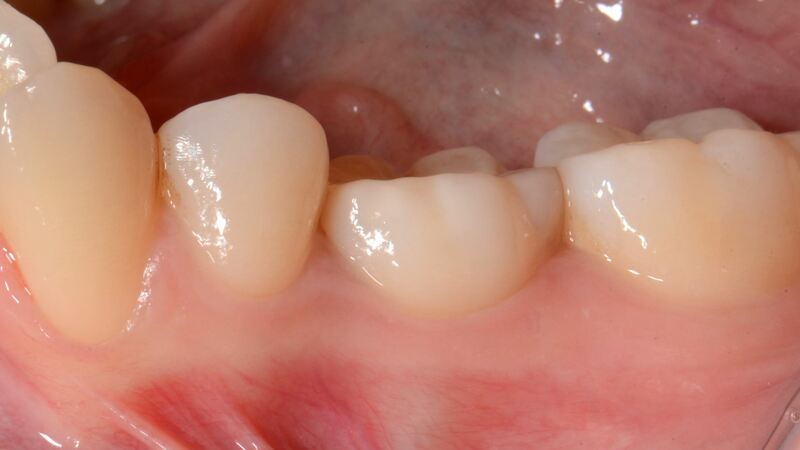 Occlusal intra-oral view of lower right scanPost placed. 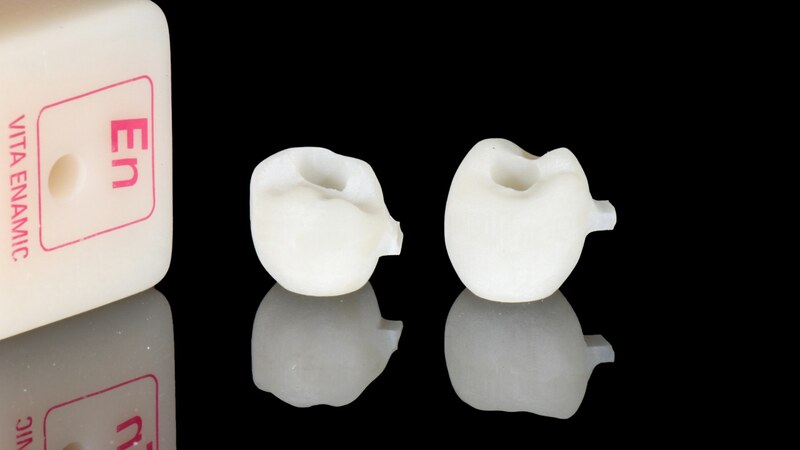 The two cad/cam crowns were milled. 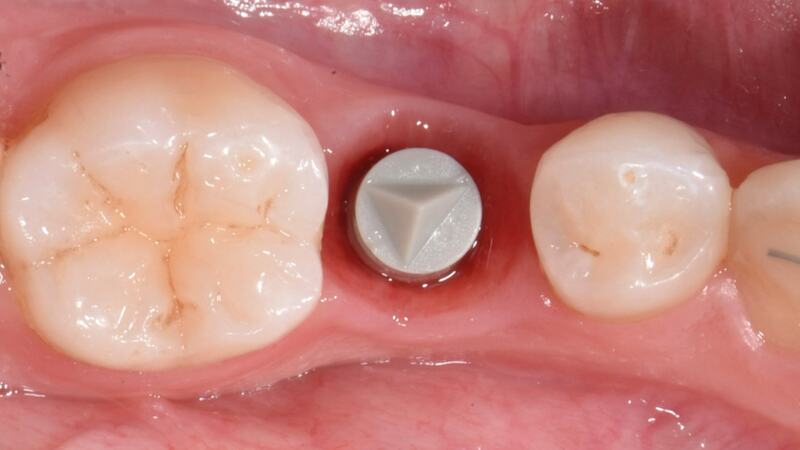 RelyX Ultimate Adhesive Resin was used to cement the crowns to the implant abutments. 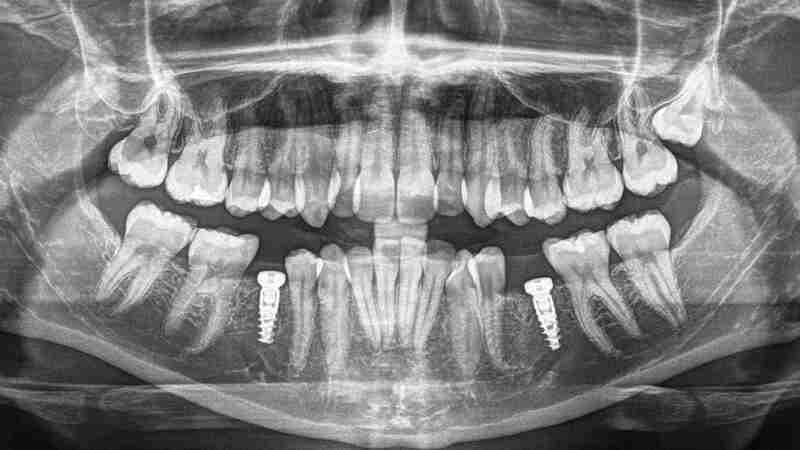 Final panoramic x-ray once the orthodontic treatment was completed. 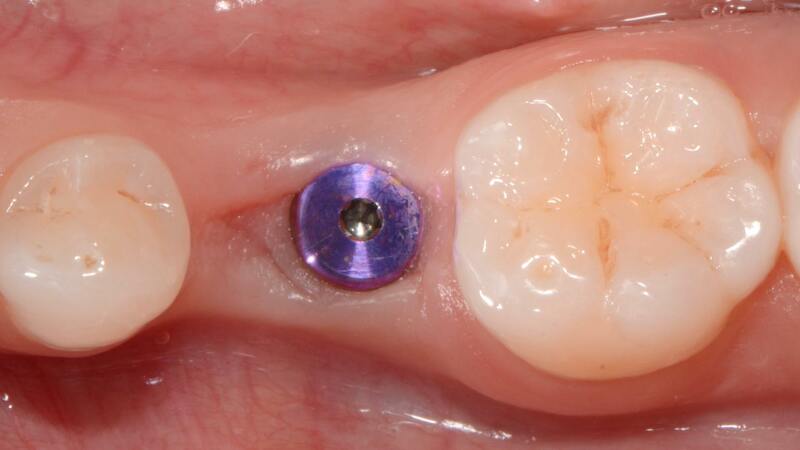 Occlusal intra-oral view of lower right second premolar implant uncovered. 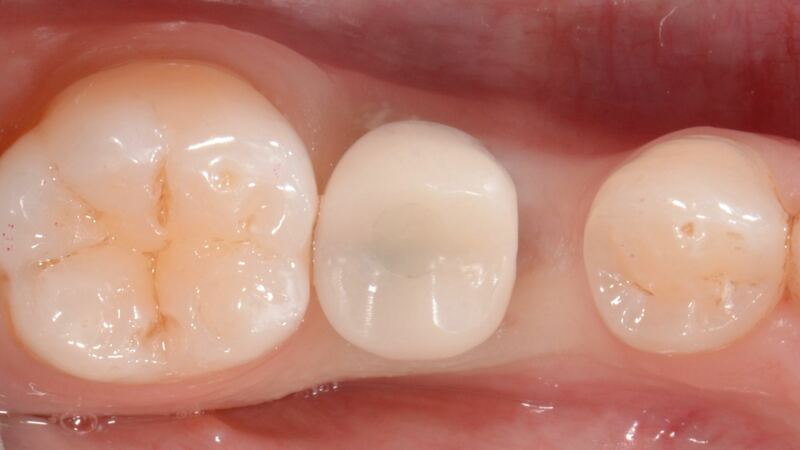 Occlusal intra-oral view of the lower right second premolar final restoration fitted. 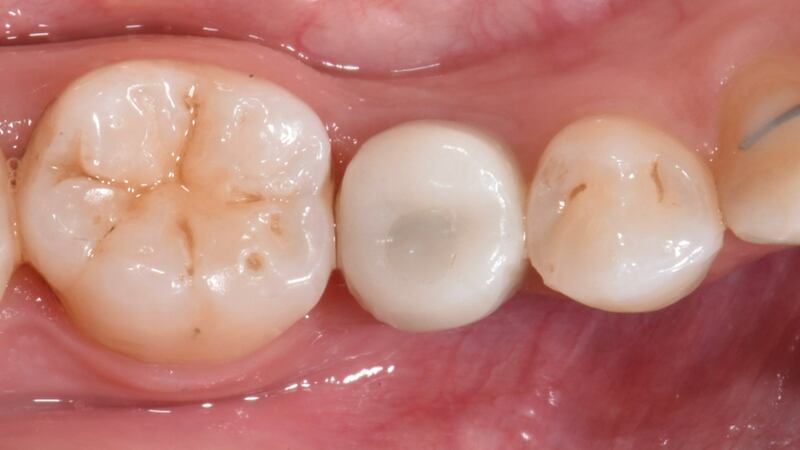 Occlusal intra-oral view of the lower right second premolar final restoration. 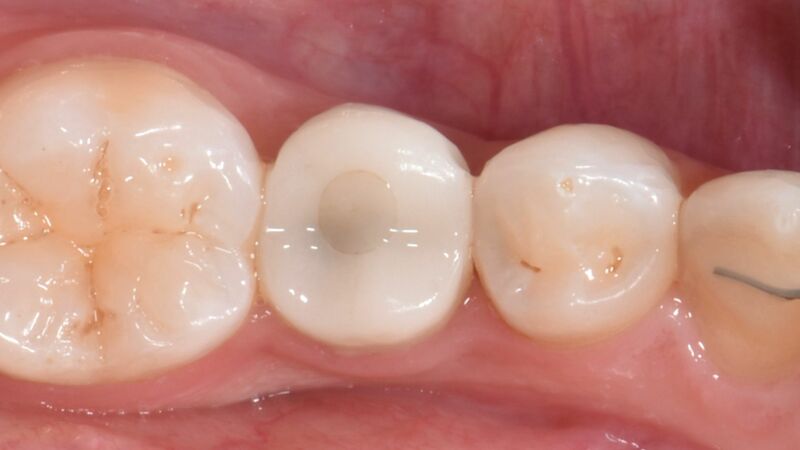 A cotton pellet and resin material was used to fill the occlusal gap. 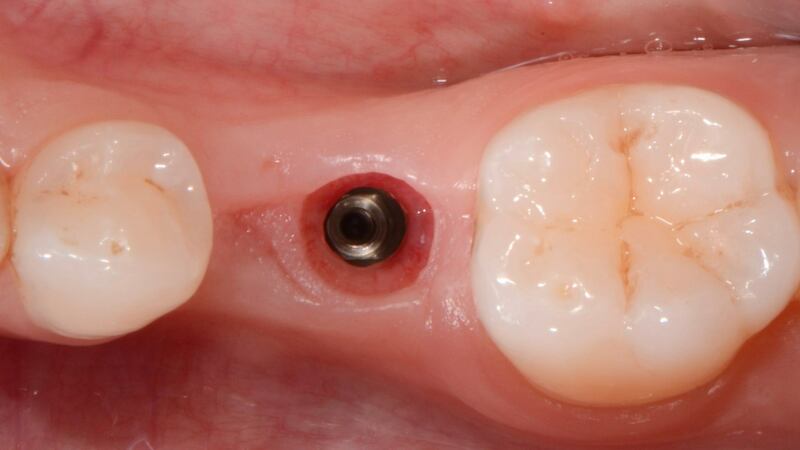 Occlusal intra-oral view of lower left second premolar implant uncovered. 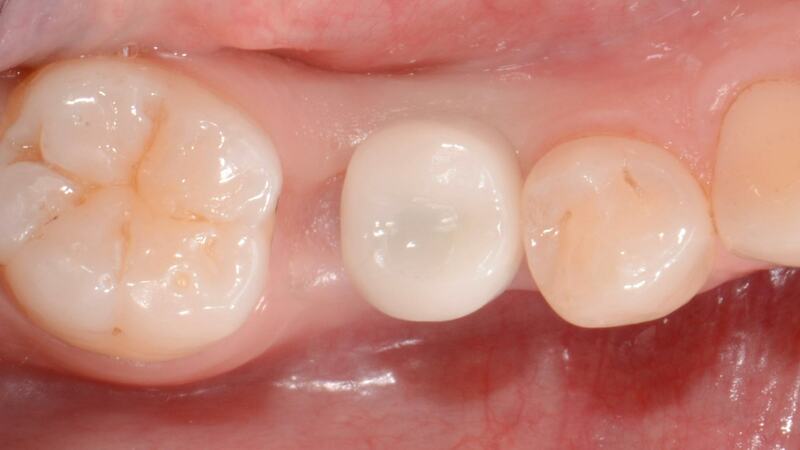 Occlusal intra-oral view of the lower left second premolar final restoration fitted. 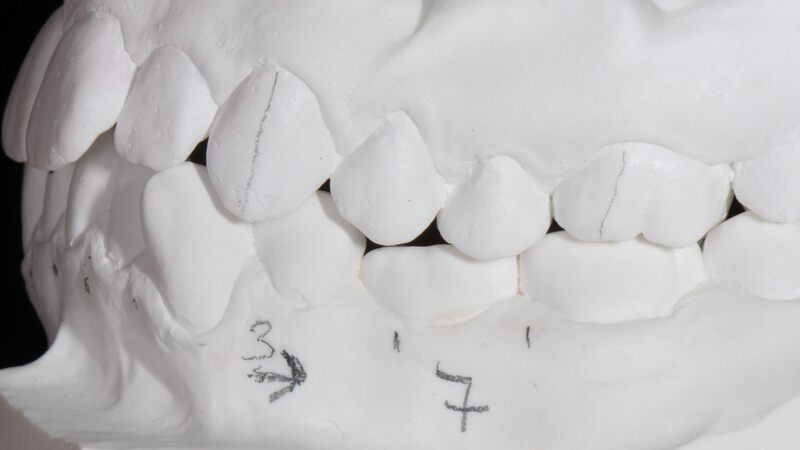 Occlusal intra-oral view of the lower left second premolar final restoration. 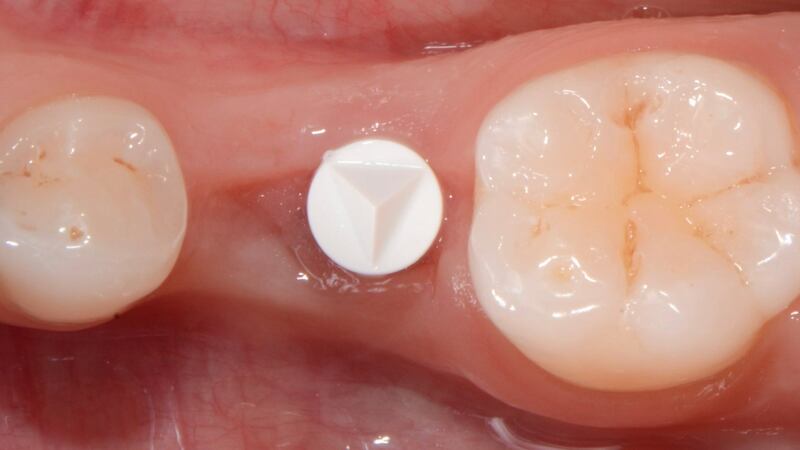 A cotton pellet and resin material was used to fill the occlusal gap. 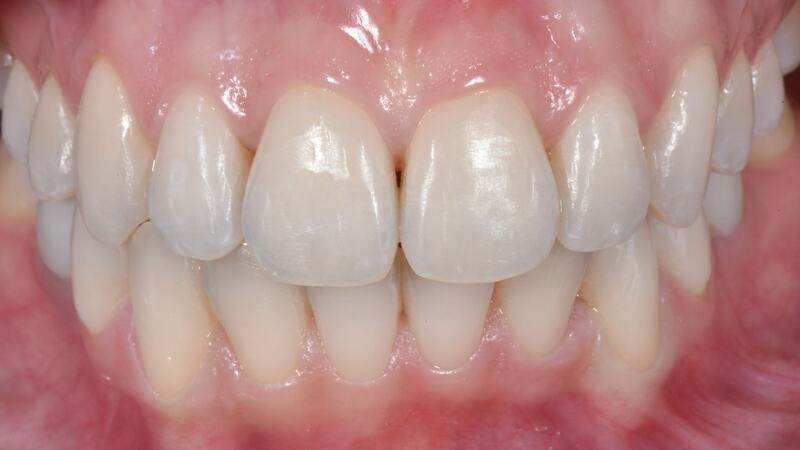 Frontal intra-oral view after the orthodontic treatment was completed and the final implant restorations were fitted. 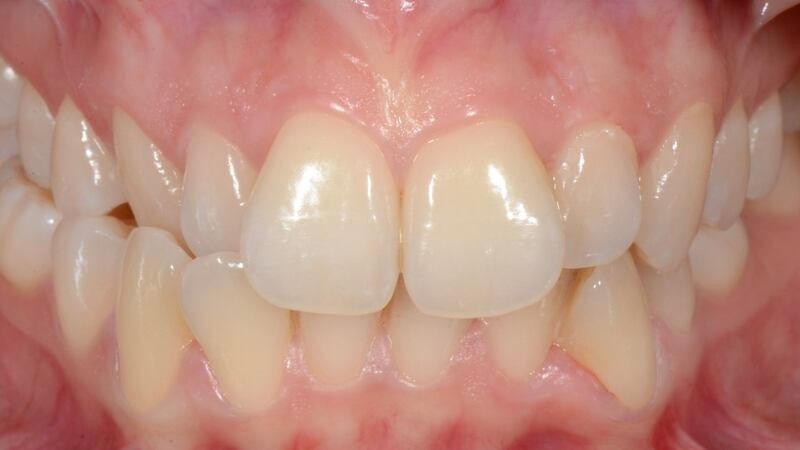 Left lateral intra-oral view after orthodontic treatment and final implant restorations fitted. 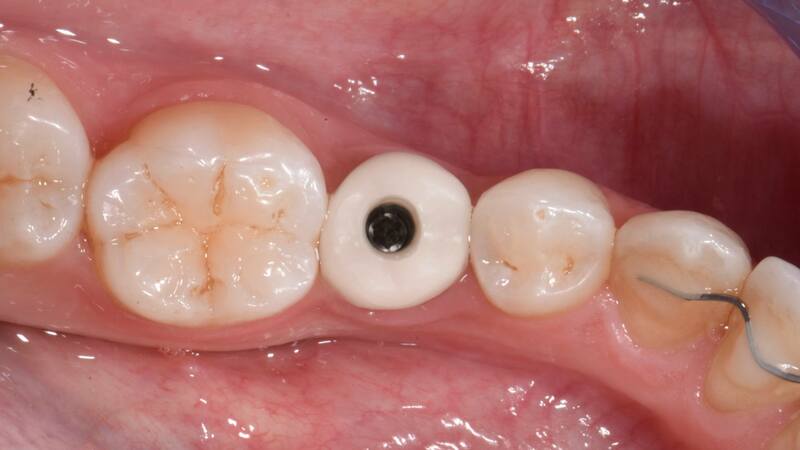 Right lateral intra-oral view after orthodontic treatment and final implant restorations fitted.